❤ Best Gift for Kids: The Campark Q3 Creative kids camera is a fantastic holiday gift for kids aged 3-6. 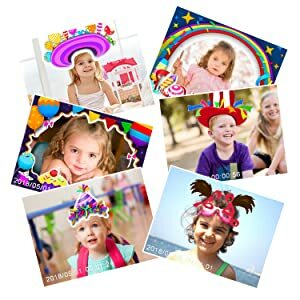 ❤ Funny Photo Frames: With 6 photo frames, your kids can take wonderful photos and develop their creativity. ❤ Easy Operation: Simple button design, easy for kids to switch among three modes with one quick click of the Mode Button. ❤ Multiple functions: This digital cam, equipped with built-in microphone, auto flash light, 2.0’’ color LCD screen, supports photo capture, video recording and playback. Let your kids save their precious experiences with this little camera. 3.This camera does not charge battery, even with rechargeable battery. With two handles and light weight ( only 180 grams ), this digital camera is easy for kids to hold. 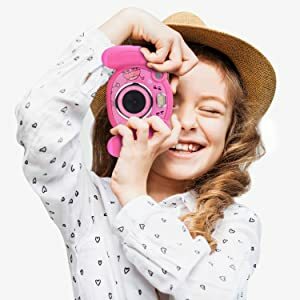 Equipped with 6 interesting photo frames, this digital camera can attract kids’ attention and increase their interest in taking photos and videos. They will have a wonderful journey of exploring the surrounding world. With environment-friendly silicone protective shell, this kids video camera is well-protected from accidental falls and drops. Also comes with a neck lanyard conveniently for kids to carry it. Made from environment-friendly non-toxic materials, Campark Q3 locks its battery bin with screws to avoid small parts or batteries from being swallowed or removed. 1×camera, 1×protective shell, 3×AAA batteries, 1×specification, 1×neck lanyard, 1×USB cable (download photos and videos to the computer), 1×screwdriver.